An ancient collision between two mega-asteroids spawned the killer space rock that slammed into Earth and marked the beginning of the end for the dinosaurs, a new study claims. Scientists think the celestial smash-up took place some 160 million years ago in the asteroid belt, located between the orbits of Mars and Jupiter. The collision would have hurled numerous large chunks of debris into space. And the scientists think one of those fragments crashed into Earth 65 million years ago to form the Chicxulub crater near Mexico's Yucatan Peninsula. Another likely carved the Tycho crater on the moon, they said. 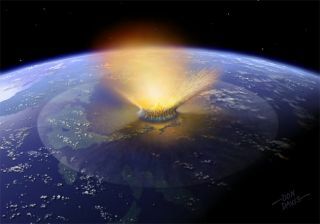 The results, published in the Sept. 6 issue of the journal Nature, rely on a series of computer models and do not represent a firm conclusion, though they are supported by information collected from the Chicxulub crater by past researchers. "There are an awful lot of models that are required in order to come to the conclusion," said Jay Melosh of the Lunar and Planetary Laboratory at the University of Arizona in Tucson, who was not involved in the current study. "I don’t find any of them implausible and the conclusion seems to be plausible." He added, "I don't have any problems with the models, but they are models." To arrive at the new smash-up conclusion, William Bottke, of the Southwest Research Institute in Colorado, and his colleagues fed information about the leftover crash remnants, called the Baptistina asteroid family, into computer models. The family, named after its largest still-orbiting member, 25 miles (40 kilometers) in diameter, originally included about 300 rocky bodies larger than six miles (10 kilometers) across and 140,000 objects larger than 0.6 miles (1 kilometer) across. The team traced the cluster back to the instant of its formation. They estimated that 160 million years ago, an object 37 miles (60 kilometers) in diameter collided almost vertically (in relation to the main plane of our solar system) with a 106-mile-wide (170-kilometer-wide) body residing in the inner asteroid belt. After the collision, the rock fragments were propelled through space by absorbing and then reradiating sunlight, a combination of processes that scientists have dubbed the Yarkovsky and YORP effect. "That heat produces a really tiny thrust, and if you wait a really, really long time that thrust is enough to move the asteroids around," Bottke told SPACE.com. "It takes millions of years for asteroids to move around, but they have time to wait." Many of the objects, they found, would have drifted into a nearby "dynamical superhighway," which shuttled them through the main asteroid belt and into Earth-crossing orbits. Bottke and his team then calculated the likelihood of a large fragment striking Earth. "Think of it like a breaking up of a big rock on top of a mountain and it starts a landslide and Earth is sort of a town at the bottom," Bottke said. "A lot of the rocks never hit the Earth, but some of them if they have just the right number of bounces have a chance of rolling through town." The team's computations indicate about 20 percent of the surviving large fragments (bigger than a mile in diameter) in the Baptistina family strayed away in this fashion, with about 2 percent of those objects going on to hit Earth. The surge of Earth-striking asteroids would account for what the researchers estimate to be a two-fold increase in the impact rate over the past 100 million to 200 million years. They found a 90 percent probability that one of these refugees struck Earth about 65 million years ago to create the Chicxulub crater, which has been strongly tied to the extinction of the dinosaurs. The impactor must've boasted a diameter of about six miles (10 kilometers) to make such a giant indentation. These simulations also showed a 70 percent likelihood of one of the pulverized rocks striking the moon 108 million years ago to form the 53-mile (85-kilometer)-across Tycho crater. "The probability is smaller than in the case of the Chicxulub crater because nothing is yet known about the nature of the Tycho impactor," said study team member David Vokrouhlicky of Charles University in Prague. Melosh said, however, that figuring out whether an object will cross Earth's path is a tricky undertaking. "If the orbit gets a little circular, it may start to be a Mars-crossing one, and then it interacts with Mars," Melosh explained in a telephone interview. "And Mars may toss it down to Earth during a close gravitational encounter. It may then go back to Mars or down to Venus." Some of the fragments from that ancient collision are raining down on us still, the researchers say. "We are in the tail end of this shower now," Bottke said. "We consider it likely that the Baptistina asteroid family is producing a significant amount of the interplanetary dust and micrometeorites that reach Earth." The fragments, they estimate, account for about 20 percent of the present-day, near-Earth asteroid population.